Anticuchos are a popular street food in South America, especially in Peru. The most traditional Peruvian anticuchos are made of beef heart, but marinated chicken (anticuchos de pollo) or steak anticuchos are also popular. 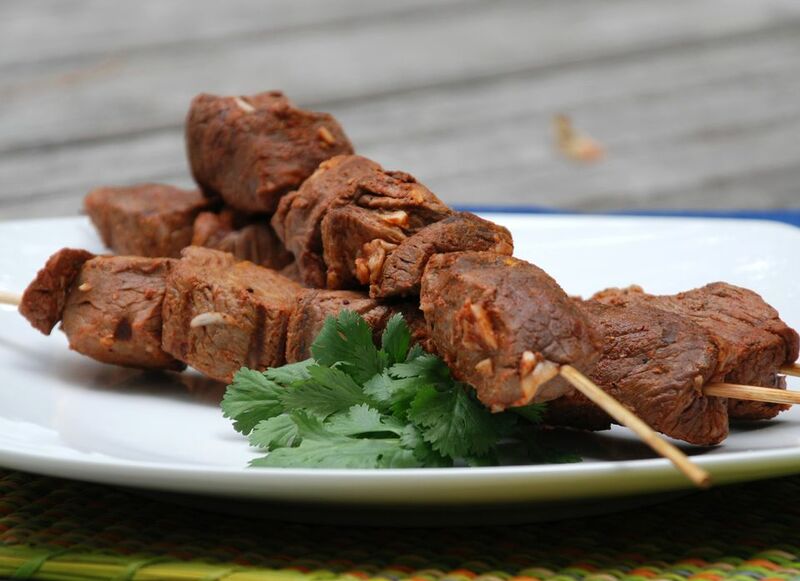 Peruvian-style anticuchos are seasoned with garlic, vinegar, cumin, and aji panca, a mild red chile pepper with a smoky flavor that is widely used in Peruvian cooking. You can find dried aji panca or jarred aji panca paste in specialty stores or Latin food markets, or online. Anticuchos are best if the meat is allowed to marinate overnight before it is grilled. Cut the beef into 1 1/2-inch pieces and place the pieces in a nonreactive bowl or dish. Mash or crush the garlic with a heavy utensil, or with a mortar and pestle. Add a little water if necessary to make a paste. In a small bowl, mix the crushed garlic, 1/4 cup of the vinegar, 1/4 cup chile pepper paste, 1 tablespoon cumin, 1 tablespoon salt, and 2 teaspoons freshly ground pepper. Cover and marinate the beef overnight in the refrigerator. If you are pressed for time, marinate the beef for at least 1 hour at room temperature. Serve the anticuchos with rice and corn on the cob.